A bit of a belated column this week due to me considering to move on to a format of one Hornets blog every two weeks and wanting to acquire a larger sample size of Kemba’s shooting with Lance off the court. What’s Up With Kemba’s Hot Streak? 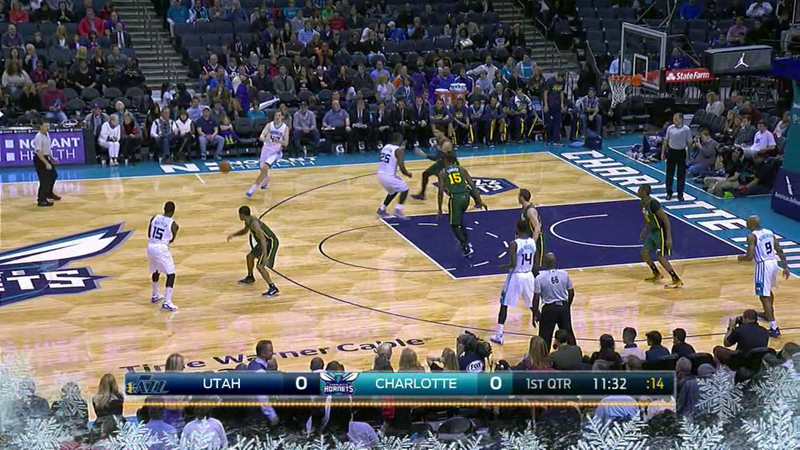 Streaky shooting is a well-known aspect of the Kemba Walker experience for Charlotte Horncats fans. The precision on these jumpers comes and goes, there always being random hot and cold streaks to his shooting. Per example, last season Walker made 45.8% of his field goal attempts in the month of December, while his shooting went down the hill after the All-Star break, him making only 34.6% of such attempts. In a similar manner, Kemba has been lights out during the last 10 games (46.2%) after starting the season rather poorly (36.0%). This time around though, the debate regarding this matter is much more interesting since there’s the variable of the much-maligned Lance Stephenson. For this purpose, I looked at Kemba’s shooting numbers, according to NBA.com, and grouped them in three different categories – the rather cold start to the season (from October 29 to December 10), the time period of him shooting great before Lance’s injury (December 12 to December 17) and the period of Lance being out (December 19 to December 27). As you can see, percentages themselves have been up all over the place, whether it’s a catch-and-shoot look or a pull-up shot. Seemingly Kemba has attempted more bad shots with his frequency of pull-up shots creeping up, while catch-and-shoot looks are on the way down (those usually are a more effective choice, but, that being said, Walker has always been among the worst in the league in them). I might note though that if you do take effective field goal percentage into account, Walker has been more more effective on catch-and-shoot shots with almost all of them coming from behind the three-point line. I can imagine that the conventional wisdom here could be the explanation that Lance is stepping on Kemba’s toes. That, yes, Kemba might be taking shots which you would call “bad” when he’s at his most effective, but this just proves that he needs his space and he’ll his shake his defender off (whether with 3 to 6 or even 7+ dribbles) to create an open look, which he wouldn’t get playing off Lance Stephenson (or Al Jefferson). Yet I’ll respectively disagree with that. There’s a reason why I created two different stints within Kemba’s latest hot streak. There isn’t any conclusive evidence that would point in favor of the anti-Lance group. Overall, the numbers are about the same, whether Stephenson played in those games or didn’t. It simply seems like a random stint of great shooting, no matter what the obstacles or the situation is. What also convinced me is an extremely helpful advanced stats page called nbawowy.com, which allows you to crunch team stats with certain players on or off the court. I ran the stats for our team with Kemba on the court and Stephenson off the court, during Kemba’s season-starting slump (due to it having a larger sample size, 177 minutes without Lance, 688 minutes with him), to compare them to Walker’s overall shooting stats and came away convinced that Stephenson was not the reason for Kemba’s struggles. He shot better in every measurable way (eFG%, TS%, FG%, 2P%, 3P%) with Stephenson on the court alongside him than he did with Lance on the bench. If one would argue that Walker’s more suited to the pull-up game and he would indeed be more effective when more of his shots came off the dribble (like during the last 10 games), then I could point at last year’s data. There’s basically no difference in catch-and-shoot and pull-up shot frequency between his blazing month of December and poor performance in March. When he’s hot, he’s making shots in every manner (for those wondering, he was at 43.6% in both categories during that last December). My Verdict: Enjoy the Kemba hot streak while it lasts. As previously covered on the blog, our starting-line up certainly makes no sense, but the subtraction of Stephenson isn’t something that has helped Kemba’s shooting. You might as well look into a moon phase calendar and try finding a reason for Walker’s streakiness. I already managed to rain on some people’s parade on a certain social basketball board called RealGM after our four-game winning streak, but I want to use the opportunity to put some of these wins into perspective by the use of some examples. How the hell can you be surprised by this twice in the first minutes of the game when that’s the action that we run the most in our games!? I bet Brett Brown was livid about this happening. Not to mention the 34 points off turnovers we managed to score, thanks to them turning the ball over 25 times. Meanwhile, the Utah game featured us giving up an unforgivable number of 15 corner threes (Jazz only made 5 of them), something that has killed us before when playing better teams. While the win at Milwaukee in the “Kemba and Knight Defensive Lapse Bowl” was admirable, don’t get me even started on Denver. That team shifts so often between completely uninspired losses after which you’d imagine a coach could get fired to good altitude-induced wins at home. As I previously concluded after Week 6, we are capable to contend for the post-season in this pathetic conference. However, I wouldn’t confuse winning some of these teams with us actually being worth something. A play that we’ve gone to all season long, yet one which was successfully executed three times during the past week. Correct me if I’m wrong, but the way I remember it is that this play precedes coach Steve Clifford in Charlotte. Perhaps, a set play installed by Stephen Silas? I might even surprise you guys with a column tomorrow or on the 31th, but either way I again wish you a Happy New Year! This entry was posted on December 29, 2014 by ReinisLacis in Charlotte Hornets blog and tagged Cody Zeller, Gerald Henderson, Kemba Walker, Lance Stephenson.